Japanese officers review fire drill by Tonarigumi (neighborhood associations) that organized civilians into enclaves of 10-12 families, began to hold regular drills for fighting "kinka" or "chikabi" (a fire in one’s neighborhood) from 0500-0700 Hours daily after the Doolittle Raid. Each household was expected to contribute a member of the family to the Tonarigumi firefighting training. With so many men in the armed forces, the civilians were mostly women. Japanese firefighting techniques and equipment were inadequate even by 1940s standards. Most cities lacked modern firefighting equipment. Most units were hand- or horse-drawn and cities lacked enough water to fight a major conflagration. The Japanese militarists considered air raids improbable and unpatriotic to plan for civil defense. Surprisingly, since Japan had experienced major fires for centuries, no effort was made to upgrade equipment and training for firefighters. As you can see here, the firefighters are using buckets, ladders and poles to contain a blaze. Training emphasized throwing buckets of water accurately, teamwork in bucket brigades, and fighting isolated fires. By training the Tonarigumi to fight a single fire together, instead of preparing them for mass outbreaks, they were thoroughly unprepared for the firestorms of 1945. 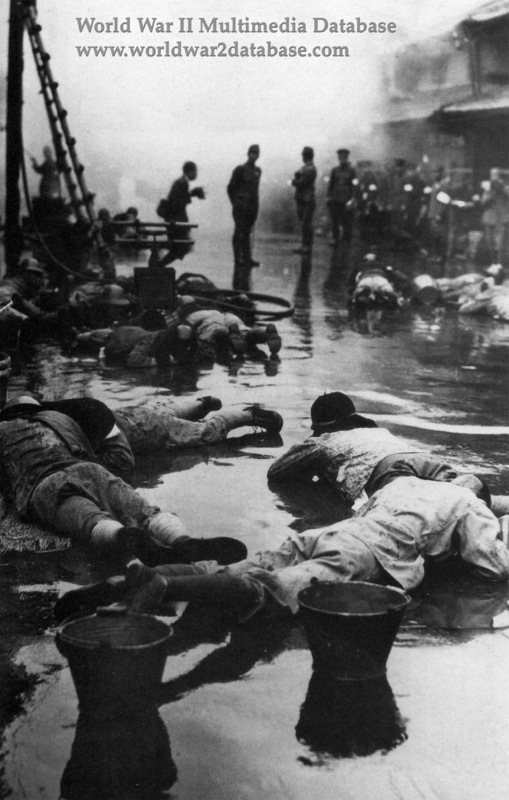 They were overwhelmed by thousands of fires and killed by the antipersonnel explosives mixed into the incendiaries.